Dairy trade between the United States and Canada has been in the news, with President Trump tweeting on behalf of Wisconsin dairy farmers and Canadian Prime Minister Justin Trudeau defending his country's supply management system and pricing policy that effectively blocks imports of U.S. ultra-filtered milk. The larger issue? Free trade across North American borders. USDEC president and CEO Tom Vilsack has been providing big-picture context on behalf of the U.S. dairy industry in interviews with top-tier media outlets in the United States and Canada. Vilsack traveled to Mexico in March with a similar message about the value of free trade with the U.S. dairy industry's largest export market, worth $1.2 billion in 2016. That particular broadcast is highlighted below because it illustrates the way the former U.S. Agriculture Secretary is assertively presenting the U.S. dairy industry's position through influential media outlets that reach millions, including policymakers in Washington, Ottawa and Mexico City. The video is followed by a transcript of Vilsack’s remarks. A complete transcript on the show's website also includes comments from Canadian Natural Resources Minister Jim Carr. Q: We just heard what Donald Trump had to say, but what specifically do you want your president to do for dairy farmers in the U.S. when it comes to Canada? 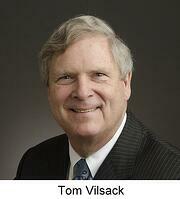 Secretary Vilsack: Well I think we just basically want a more open market. We want to take a look at tariff lines. We want to take a look at ways in which the Canadian government in the past has in our view manipulated the market a little bit to make it more difficult for imports from the U.S. to come in to that market to provide Canadian consumers choice and options. We think this is an appropriate time to renegotiate, to modernize, to basically take a look at NAFTA that’s been in effect for a little over 20 years. It’s time to address some of these concerns that we’ve had for several years actually. Q: Do you fundamentally believe that the Canadian government’s supply management system for dairy needs to go or is wrong? Secretary Vilsack: It’s not a question of us making a decision about whether or not it should go or not. That’s obviously the Canadian government’s decision. We want it to function in a way that allows our market-based system to have a fair and more open opportunity to compete in Canada—access to markets. We don’t want the rules of the game to be changed in the middle of the game. We’ve seen a number of incidences over the years where the rules have changed and made it more difficult for U.S. imports to get into Canada in a fair way. That’s all we want. We’re not asking that the entire system be dismantled. We just want more fairness and more transparency. Q: Lately, we’ve heard from President Trump of course specifically around ultrafiltered milk products. I wanted to point out a few statistics. Of course last year, Canada imported about 17 per cent more dairy products from the U.S. than the year before. The U.S. actually has a net dairy trade surplus with Canada that trade and balance, I believe favors the U.S. 5:1, and there’s a supply glut internationally of dairy products. Is it really all Canada’s fault? Secretary Vilsack: Well here’s the problem with using some of the statistics. It’s very difficult to look at the export numbers from the U.S. because a lot of what is exported into Canada is exported out of Canada immediately. There’s obviously reciprocity there. So it’s very difficult to look at those numbers. The bottom line is this, with ultrafiltered milk, in a market-based system, the market would decide. What happened here was that the Canadian government decided to lower the costs and the price, providing an incentive for processors in Canada to use Canadian products and making it more difficult, in fact, if not impossible for U.S. imports. That we think is contrary to the spirt and the letter of trade agreements and we hope that as this is being discussed and renegotiated that this problem is corrected. Q: Beyond dairy, the North American Free Trade Agreement (NAFTA) of course has been front and center this week. President Trump at one point indicated that he would pull out of NAFTA. Then your successor in agriculture, Sonny Perdue helped convince him not to do that. How disastrous would be for American farmers if the president actually were to pull out of NAFTA? Secretary Vilsack: Well I think the U.S. agriculture is united in its belief that there are good things about NAFTA as it relates to agriculture that need to be preserved and there are some areas that need to be strengthened. When we talk about dairy, for example, obviously we have a good market in Mexico. We don’t want to interfere with that. We just want more openness with the Canadian market. So, on balance I think secretary Perdue’s advice to the president was sound. This is not the time to pull out of NAFTA. This is the time to modernize it, to take some of the issues that have been irritants for a considerable period of time and try to resolve them, get them in a better place. This is an important relationship between the U.S. and Canada and Mexico. It’s an important economic relationship. We obviously want to preserve it, we want to strengthen it. Q: The rhetoric over the last week though has been incredibly heated. Understandably I think you’d understand that Canadians are kind of at the edge of their seat wondering what President Trump will say next. Given your time as secretary of agriculture, do you think any permanent damage has been done to the relationship between our two countries? Secretary Vilsack: Well I hope not. I sincerely hope not because I think it’s an important relationship. Certainly understand the concerns and frustrations that Canadians and others may feel about some of the comments coming out of Washington. But as we say down here, ‘actions speak louder than words’. And I think right now, what we’re looking at is an opportunity to renegotiate, an opportunity to have the parties come to the table with a list of grievances, a list of concerns, get them aired out, get them worked out so that we have a stronger, more viable NAFTA relationship that is beneficial to all three countries, and the consumers and producers and farmers and job seekers in all three countries.